In Win is one of the few companies out there that has the knowledge and the facilities to build some of their PSU offerings themselves, instead of buying a ready platform from one of the usual OEMs (FSP, Seasonic, Delta etc. ), making the GreenMe series an in-house product. We are pretty sure that this is the main reason behind the attractive price of all GreenMe units. The GreenMe PSUs come with another added bonus, besides being made by In Win. For every unit sold, In Win is committed to donate $1 to the WWF (World Wide Fund for Nature) organization. The donation to the WWF is the reason they named their series GreenMe in the first place, since a Bronze efficiency PSU isn’t considered friendly to the environment, at least if compared to Gold and Platinum efficiency units. Nevertheless, in an attempt to increase the eco-friendly profile of the GreenMe units, In Win ships them in a box that is composed of fully recycled materials. The new GreenMe units come in three versions, with 550 W, 650 W and 750 W capacity. 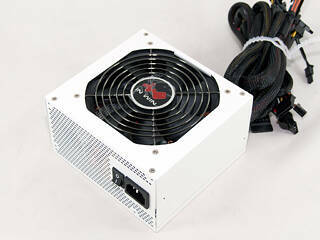 We will test the 650 W capacity unit in this review. Like all GreenMe series PSUs, the GreenMe 650 features a white paint-job that helps it stand out from the crowd of dark colored PSUs, utilizes a non-modular cabling system and, although it has a low efficiency rating for today standards, still uses DC-DC converters for the generation of the minor rails. The last feature provides an efficiency boost and the ability to deliver its full power on the +12V rail alone, which, in this case, consists of four virtual rails.